On Saturday, I got a very nice piece of wool from Mr C’s Strategic Fabric Reserve, just the color and weight I’d been looking for to make a Very Specific Spencer. 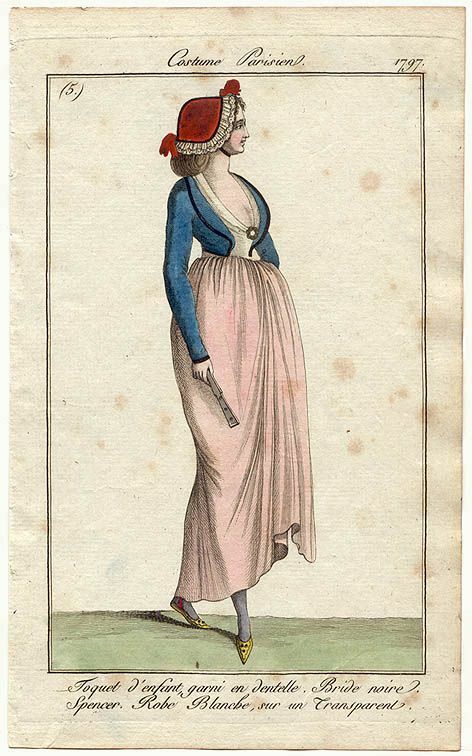 The VSS is not a replica, but rather specific to a gown: I want it to go with a 1797 V&A print. 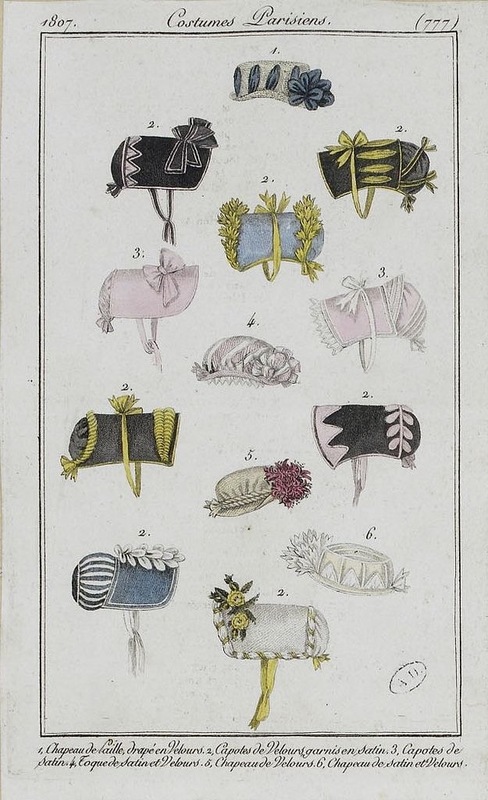 Did women wear Spencers in 1797-1800 Providence? 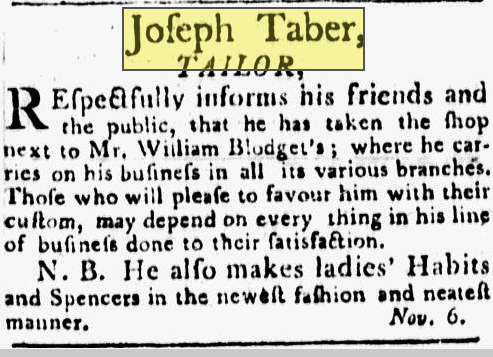 At least one tailor, Joseph Taber, advertised that he made Habits and Spencers, but as far as I know, there are no extant Rhode Island Spencers. Given how few collections are fully online here, and how few Spencers survive anywhere, I’m not too surprised. Julia Bowen’s diary covers Spring and Summer, when she’s quilting (mighty lazy work, she says), but she doesn’t say much about outerwear. I’ve been on the fence about how common Spencers were– after all, the drawings in Mrs Hurst Dancing show women clearly wearing red cloaks– but might a Spencer and cloak combination have been just the thing to keep warm on a raw October day? With a wool petticoat and long wool stockings, you could be fashionable and warm. There’s no firm documentation of any of that– which does not mean, as I once muttered in the general direction of some recalcitrant docents, that rich people in Providence hunkered naked in cold corners of curtain-less rooms gnawing on raw meat. ** What it does mean is that much of what we make and wear is conjecture, based on examples from the same time period in other geographic areas. Cassandra’s posture is very different from mine. She will not pull her shoulders back! This wool is buttery and soft, and takes the needle well. Waxed thread glides through it and grips. It does have a tendency to fray a bit at the cut edges, but has a good pinked edge, and there are examples of pinked-edge facings in extant men’s wear. Sweet, right? I’m not showing you this to boast about my skills, but to show off an dandy mistake. 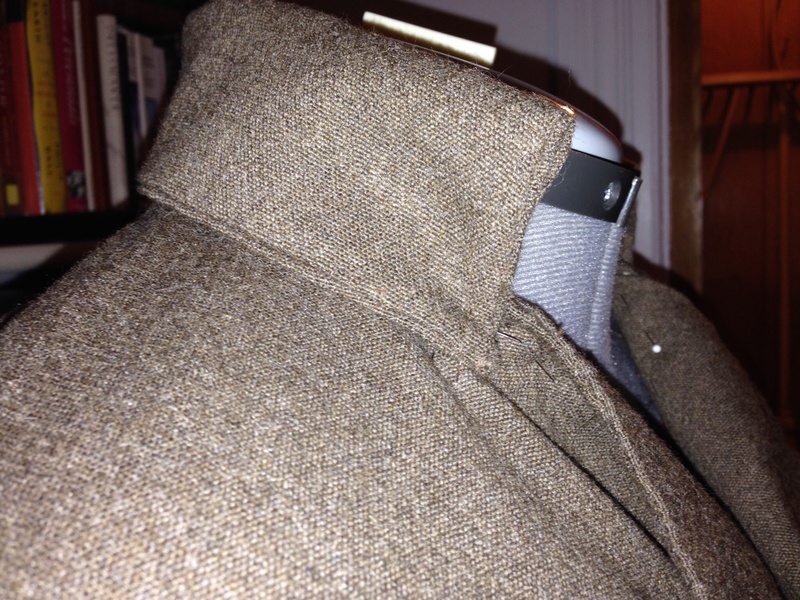 In working the folded edge of the collar, I trimmed a bit too much at the neck edge, and found the collar a bit small when I basted it in. Of course I removed it, and started again, easing a bit more as I went: Huzzay! It fit! Oh, reader: rejoice not. I backstitched that bad boy on upside down. Expletive deleted! Mad Skillz: I even managed that bit of genius before my pre-work panic attack. I took the garment in to work to seek council from my tailoring-class-educated friend who possesses native common sense and Yankee practicality. 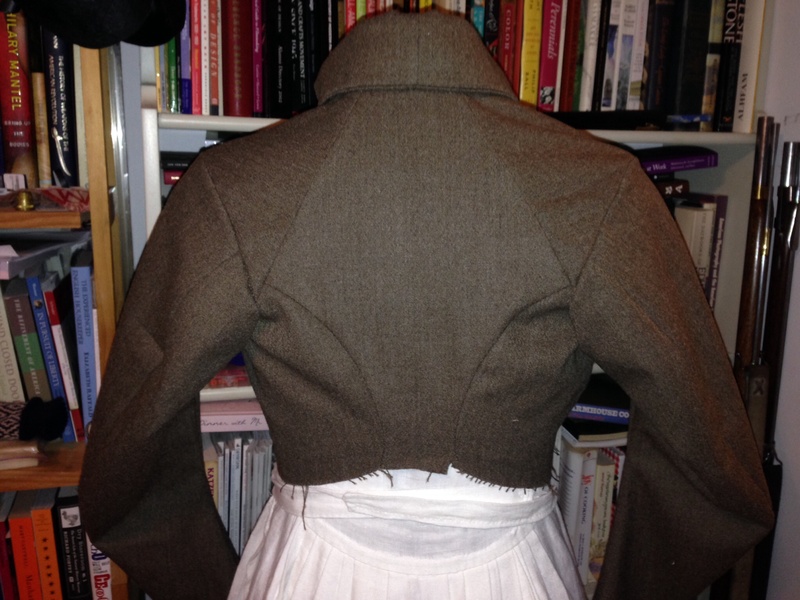 It came down to this: is it worse to have the collar upside down, or to have it not fit as well right side up? 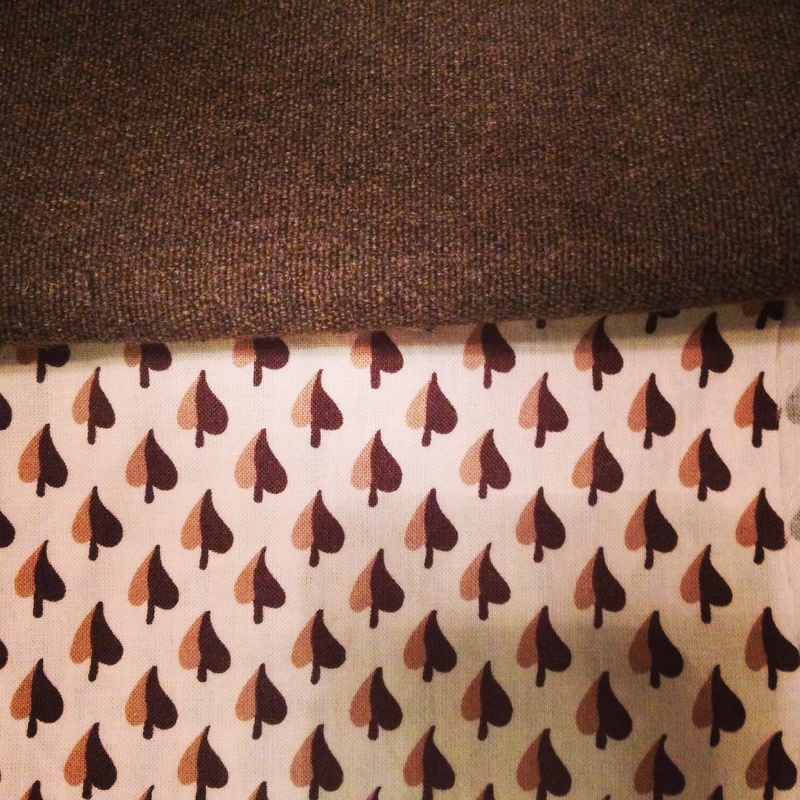 Decide with the knowledge that working the fabric more will affect the cut edge badly. My friend suggested stitching in the ditch with contrasting thread to make this flaw an Intentional Design Element. Black trim on a Spencer? That is a good idea, but I thought the flaw will still be too noticeable. Then it came to me: trim. Just as the construction guys are spreading drywall mud in the chinks around the window frames, I can spread some wool braid love around this collar. There’s certainly evidence for trim use on Spencers in fashion plates, and trim would push the men’s wear aspect of this garment even farther. As soon as I got home, I double-checked extant garments and fashion plates, Roy Najecki’s lace page, and measured my edges. Four yards of quarter-inch black mohair braid should do the job, stitched around the edge of the collar and lapels, the cuffs and possibly the hem edge. Do I run the chance of looking like a black-outlined cartoon drawing? Yes. Did I just buy endless hours of tiny stitching? Yes. 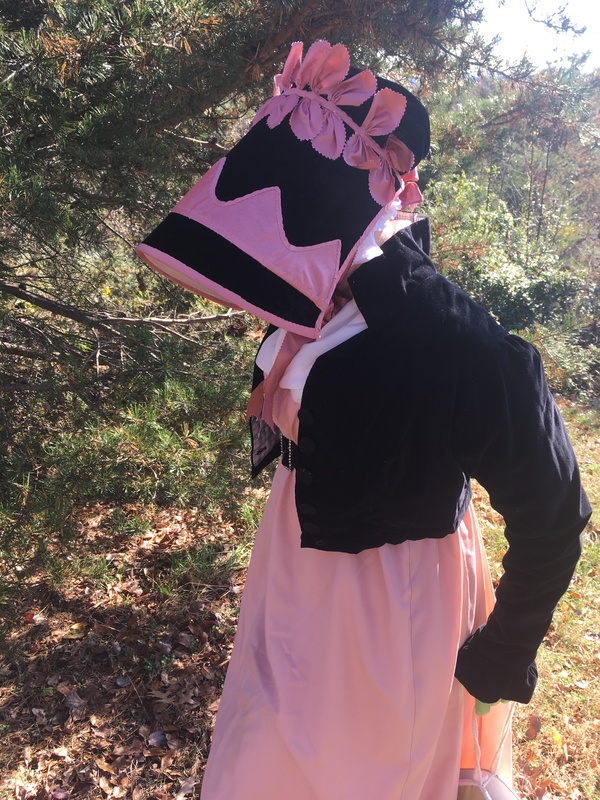 This is a crazy, work-making solution that may leave me with a garment not suited to my class in early Federal Providence. But I think it’s going to look amazing when it’s finished.